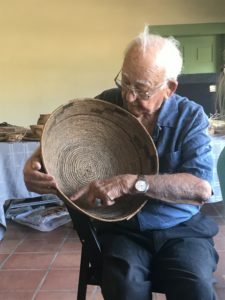 At 92 years young, Justin vibrantly spoke to and spent a pleasant and casual two hours with about 40 RLC attendees, all who came out specifically to see a wide variety of pieces from his own personal basket collection that he has acquired over the past several decades. 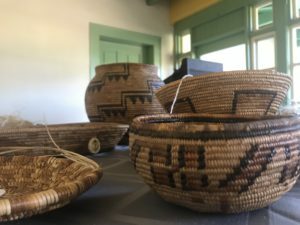 However, according to RLC Curator Sarah Wolk FitzGerald, what everyone got out of the morning’s event was above and beyond beautiful baskets. Justin didn’t just share and show off his personal collection, but he also demonstrated different weaving styles and techniques spanning a variety of materials, all while connecting basketry to different historical points across a mix of California Native American history time periods and specific geographic locations. Additionally, one lecture attendee showed up to the event with her own baskets, which Justin graciously and enthusiastically assessed. He was able to share with the group that just by his cursory look over one particular piece that it had been woven by two people. Justin also was able to date some of her personal pieces and provide information and detail that was unknown previously. How’s that for a spontaneous and hyper-local Long Beach version of Antiques Roadshow! Lecture attendee and RLC volunteer Joy Zadaca gushed about how impressed she was with Justin’s wonderful demeanor and enthusiasm throughout the event. “I have always loved baskets,” Joy said, “but this sweet man shared so much about California and Native American history… I wish someone had videotaped this… truly living history.” Joy went on to explain how Justin described that so much of the traditional Indian culture was removed and remained closed off from Native Americans, especially during the California Mission time period, sharing how challenging it was and has been for so many – including himself – who wish to reclaim and regain their original customs such as basketry due to these historical gaps. Ipay Elder Justin Farmer assesses a basket brought by a visitor to the lecture. Thank you so much again to Justin Farmer for driving out to RLC for such a wonderful and enjoyable morning for our members, volunteers, and visitors! Now that you’ve learned just how fantastic this event was, you won’t want to miss the next three events in this series! Coming up on Saturday March 16th RLC will host Tongva archaeologist Desireé Martinez, who will be here to discuss the Pimu Catalina Archaeology Project and their work developing chronologies of Native Peoples across Catalina Island. Following that will be two hands-on events where attendees will be able to make and take a piece of history with them! On Saturday April 27th, Julia Bogany, a Tongva Tribal Councilmember, will lead a special children’s workshop where youngsters can make necklaces and learn a few Tongva words. 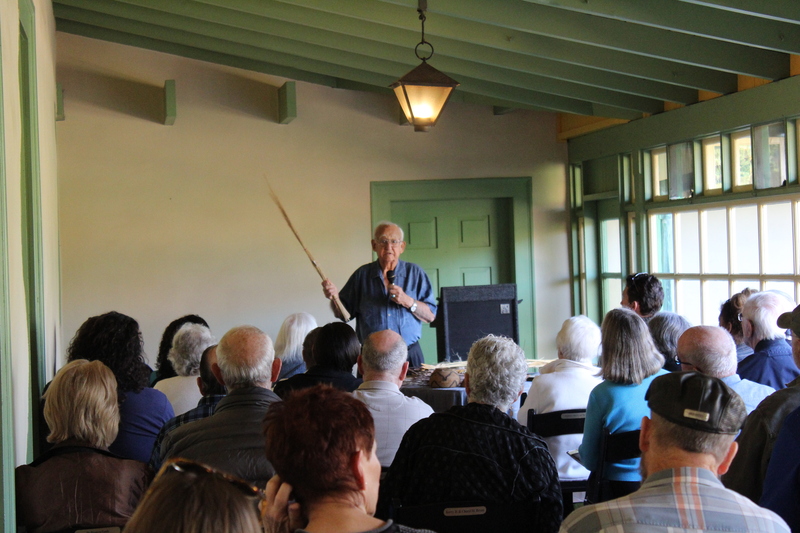 To close out the series, on Saturday June 15th, Tongva artist Craig Torres will lead a workshop where participants can create clapper stick instruments from elderberry bush branches. All events are scheduled to begin at 10 a.m. We hope you plan to join us!